Note: The Western States Trucking Association can help you file your MCS-150 update. Click here for more information. As part of reforming California’s BASIC Inspection of Terminal (BIT) program – formerly known as the Biennial Inspection of Terminal program (effective 1/1/2016) every California-based motor carrier that only operated within the state was assigned an “intrastate only” U.S. DOT number (the assignment of this number does not allow you to operate across state lines). When the U.S. DOT numbers were assigned, certain data elements were omitted from each motor carrier’s profile (e.g. previous year’s fleet mileage and whether drivers typically operate within a 100 air-mile radius). There are two types of letters being sent from US DOT (see images below). One was triggered because none of the U.S. DOT numbers assigned included needed information in a specific data field such as the number of drivers with a commercial driver’s license (CDL) within a fleet. The other type of letter is for “interstate” authorized motor carriers reminding them of their duty to perform the required update. As you have terminal and roadside inspections and those reports are submitted to Washington under your U.S. 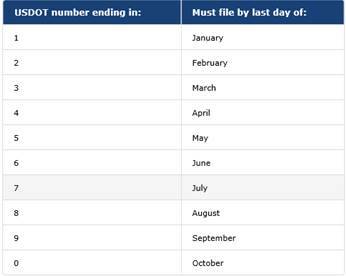 DOT number, the missing data triggers a warning to federal officials that you are operating commercial motor vehicles (CMV’s) requiring a CDL and it appears to them you are using unqualified drivers. NOTE: U.S. DOT has been updating their data system and they have had major problems. We have learned that motor carriers nationally are receiving similar letters. We also know that updates have been performed and generated the new MCS-150 only to have the feds’ system not record the update. A motor carrier shall ensure information associated with the United States Department of Transportation number assigned to the motor carrier is true and accurate. The information shall be updated as required by Part 390.19 of Title 49 of the Code of Federal Regulations, before the motor carrier operates a commercial motor vehicle, at least once every two calendar years, and within 15 days of any change of information or cessation of regulated activity. Updating your information as requested by the letter you have received from the U.S. DOT can be done electronically online, via paper form submission, or the association will perform this task for a fee of $25 for members and $49 for non-members (click here). If all data matches you will be taken to a screen that asks for a credit card number. THERE IS NO CHARGE, a credit card is used to validate you are who you say you are. Once submitted you will be emailed your PIN instantly. When you get your PIN go to this link to begin electronically filing your update – http://li-public.fmcsa.dot.gov/LIVIEW/PKG_REGISTRATION.prc_option. You will need to click on the fourth button down from the top that states, “I need to update my USDOT number registration information or file my biennial update (MCS-150).” You will be taken to another page and must click on the button “File Electronically.” You will then be directed to another page where you will enter your US DOT number, PIN, and US Federal EIN and then hit the “Continue” button. A screen will appear that shows you the company for the data entered and you must either choose “Continue” or “Return to Selection” if the carrier displayed is not you. If the U.S. DOT number, PIN, and federal EIN all match within the federal system, you will be directed to a page to enter your personal information and credit card number which is only used to validate you are who you say you are. Whenever a CAPTCHA appears you will need to enter the words that are shown to advance within the system. You will finally be taken into your motor carrier profile. Do not make any changes on the first screen, advance to the second screen. You will need to check all entered data for accuracy and make any changes. If any punctuation was originally used in creating your DOT number is will need to be eliminated because the federal database does not accept punctuation (e.g. ABC TRUCKING, INC. Both the comma and period will need to be removed or the system will not accept your update). Check phone numbers, add an email address, and in the section for mailing address add “California” as it was not included for any created DOT number. Lastly, revert all nine digit zip codes to the five digit zip code. Advance to the next page. Here you will need to add total fleet mileage for calendar year 2016. It doesn’t have to be exact, the feds like it within 10,000 miles though. You will also need to enter the year “2016” as the reporting year. DO NOT alter anything in the section for COMPANY OPERATION or OPERATION CLASSIFICATION. You will need to enter the type of cargo or commodity you commonly haul. For freight operations it is typically just GENERAL FREIGHT. For construction trucking most typical is OTHER and you enter ROCK, SAND, GRAVEL. DO NOT CHECK OFF ALL TYPES OF CARGO CLASSIFICATIONS, keep it simple. Insurance companies look at this data in underwriting and if you check off too many you could end up it trouble at insurance renewal time. Next, check the number of vehicles operated for accuracy – including trailers. Finally, you need to enter the proper number of drivers and how they operate (intrastate or interstate). You only count each driver once even if they switch back and forth. Finally, you enter the number of drivers with a CDL. You can now proceed to the next screen where you will be told if your update was successful. A blue round button appears and you click on it to open an updated form MCS-150. Print or electronically save a copy. You are done! NOTE: Sole-proprietors (owner-operators) that submitted a social security number to California DMV for their Motor Carrier of Property permit will not be able to update online because to protect their social security number a special code was used when creating the U.S. DOT number. We have that code but cannot publicly disclose it for security reasons. You will need to file a paper form or have us do an electronic filing on your behalf. You will need to mark as your reason for filing “BIENNIAL UPDATE.” Sections 1-16 are self-explanatory. If you do not have federal operating authority DO NOT put your Motor Carrier of Property (CA number) in section # 17. A federal MC number is different than the Motor Carrier Permit number many often refer to as their “MC” number in California. Don’t worry about #18 – DUN & BRADSTREET number, it’s not required. If you have a federal EIN number, use that in #19 otherwise you will need to place your social security number there. Check mark the appropriate box in #22 – virtually everyone should be selecting “C,” INTRASTATE NON-HAZMAT CARRIER. For section #23 most will select “A,” AUTHORIZED FOR HIRE. In section #24 follow check only one box. DO NOT CHECK OFF ALL TYPES OF CARGO CLASSIFICATIONS, keep it simple. Insurance companies look at this data in underwriting and if check off too much you could end up it trouble at insurance renewal time. Section #26, write in the correct number of trucks and trailer operated. Finally, you need to enter the proper number of drivers and how they operate (intrastate or interstate). You only count each driver once even if they switch back and forth. Finally, you enter the number of drivers with a CDL. Complete section #29 and #30, sign, date, and enter your title (e.g. owner).